Update Nov 2017: GreedyGammon 3.0 is here!! Better screen support for 1920*1080, full screen mode with larger boards. And the biggest cool feature is it will allow players to chat/play remotely with each other without using any third party server service. Just email a connection string to your BG buddies and they can connect and interact with you. Please post any questions or feedback in the forum. Forum topic how to connect is here! Last postHi, lets play some backgammon! GreedyGammon will offer multi language support starting with version 1.0.43. 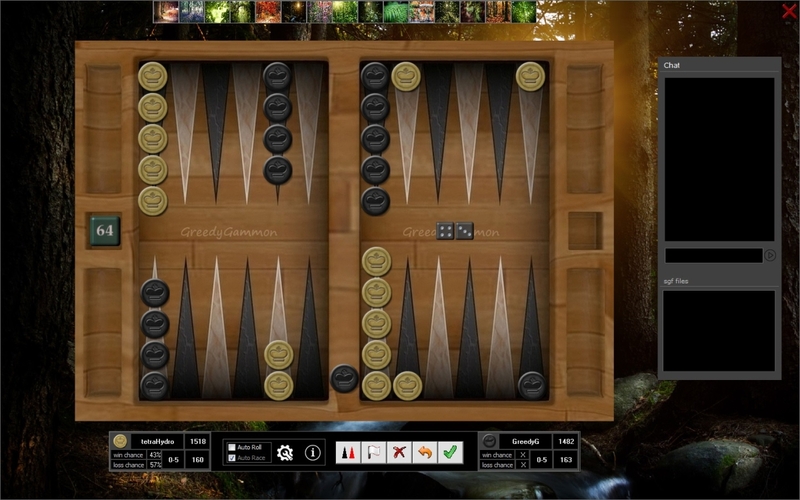 GreedyGammon is a free backgammon game for MS Windows. The game evolved over the years from a FIBS client as 3DFiBs and FiBzilla to running on its own server as GreedyGammon. The current version 3.x revives the player vs player functionality with a direct connection between the players, eliminating the dependency on an external server. GreedyGammon offers an aesthetically pleasant interface with picture backgrounds and a professionally designed board. Games files can be imported into Gnubg proper for analysis. Many game play features that make playing fun are implemented, like greedy bearoff, auto forced move, auto race on broken contact, auto resignation options for game over situations. .
GreedyGammon is offered for free to the world for everyone to discover and enjoy the beautiful game of backgammon. ENJOY! !